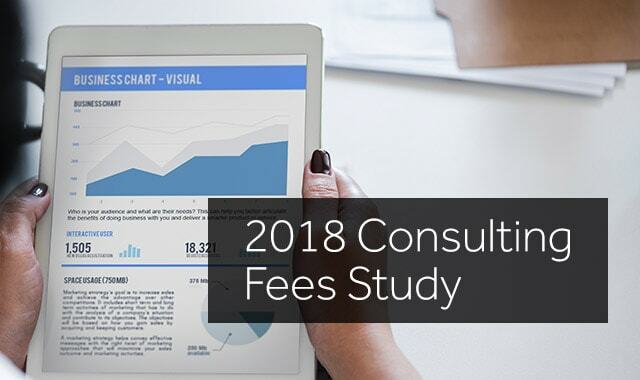 I’m excited to share the results of our 2018 Consulting Fees Study with you. Before I provide you with all the details and results — I’ll also tell you about a funny story. A bit of background first. Each year we poll our list of consultants. With over 33,000 consultants getting our regular emails, it’s a sizeable and meaningful group to poll. I’ll quickly mention that our 2018 Marketing for Consultants Study will also be published. Stay tuned for that — or join our email list so we can notify you when it’s out. It is my observation and experience that these same people who focus on what’s missing in a given situation instead of appreciating the benefit sitting right in front of them are the same people who struggle in business. Think about that for a minute and you’ll quickly understand why that is. Now, back to the study. We do our best to make the poll as easy and efficient to understand as we can. Our goal with this study is to provide you with comparisons, benchmarks, and ideas that you can use to improve your consulting business. I welcome you to share any questions, ideas, or ways that you believe the study can be improved in the comments below. The most common and popular consulting fees and pricing structure used by consultants. We also asked how many years people have been consulting and where they currently live. We do this so we can see if there are any noteworthy distinctions in the data based on these variables. Before we get into the juicy data that you’re here for, it’s important that we look at where this data comes from. As mentioned above, we send this poll to over 33,000 consultants on our email list. 59.5% of the people who responded live in North America. 72.5% of consultants based their fees on time. They do this through a mix of hourly rates, daily rates, and project-based rates. I’ve been saying for over a decade that consulting fees based on time, while easy to implement, also means you’re leaving a significant amount of money on the table. Merely 12.2% of consultants use ROI and value-based consulting fees in their consulting business. 15.3% of use a monthly consulting retainer approach to their pricing and fees. We didn’t find a big difference between the fee structure used in different geographic regions. The next data point looks at the average engagement size (in USD) per client. 24.8% of consultants report that their average consulting project fee size is between $500 to $2000. A higher percentage of these respondents are from Africa and Asia, though certainly not exclusively. For 56.7% of consultants, their average consulting project is $10,000 or less. 30.9% earn between $10,000 and $50,000 per project. 6.6% of consultants earn between $50,000 and $100,000 per project and 5.8% earn over $100,000 USD on average per client project. Most consultants who specified they earn over $100,000 per client project are based in North America, Western Europe, and Australia. Over 50% of consultants who earn over $100,000 per client project have been consulting for 10 years or more. If you’re still new to consulting, a six-figure consulting project is still attainable, as 25% of those earning six-figures per client project have less than 4 years of consulting experience. This is always a popular question to explore. How much do consultants typically earn? As you’ll see from the data, a wide range exists. 24.3% of consultants earn between $120,000 and $540,000 per year. 30% of these consultants have 10 years or more of experience as consultants. 44%, on the other hand, have less than 4 years of experience. This proves that earning six-figures as a consultant is within the reach of many people within a relatively short period of time. In fact, we’ve seen many of our coaching clients reach six-figures in consulting income within 6 months. 5.9% of consultants earn between $500,000 and over $3,000,000 per year. 2.9% earn well over 7 figures as consultants. What Is the Profit Margin In a Consulting Business? Many people (especially online) like to talk about how much money they make these days. What they often don’t tell you is how much of that they actually keep. With this question, we wanted to find out the average profit margin consultants have. In our business, we typically hover around 75%. 44% of consultants enjoy a very healthy profit margin in their consulting business of over 70%. 22.1% have a solid margin of between 50 to 60%. 16.3% of consultants sit at 40% margin and over 20% of consultants have a profit margin of 30% or less. I’ve spoken with many consultants who want to grow their business and income. In some cases, they were doing a solid seven figures in their business. Yet their profit margin was terrible. The usual causes for this are overstaffing, a lack of effective systems and processes, low fees, and heavily customized service offerings to name a few. On the other hand, consultants who enjoy high-profit margins tend to be very focused, have great systems in place, apply a solid approach to their consulting fees, and run their business lean. Over 80% of consultants who participated in this study said they would like to earn higher fees. About 25% of those responses cited their local market or economy as the reason why they aren’t earning the fees they would like. If that’s how you feel, then I have news for you: that’s an excuse. Your local economy or what’s happening in the market is out of your control. Rather than focusing on that, start learning how to attract and win business from new markets. Whatever you feel is holding you back from earning higher consulting fees can be overcome if you truly desire to change your current situation. You’ll find plenty of free resources to help you with all aspects of your consulting business here on the Consulting Success website. If you’d like our personal help to guide you step-by-step so you can start attracting ideal clients consistently, learn how to increase your fees the right way, and grow your business, I invite you to explore our coaching programs for consultants and get in touch. We hope you’ve enjoyed this post. Take a minute right now to share your feedback and comments below. If you have an idea for other questions you’d like to see us ask in our next poll, share them below. It would be very interesting to see movements between 2017 and 2018 poll results. Would it be possible to extract and analyse? Thank you and best wishes from Ukraine. Hi – interesting data – thanks for sharing. 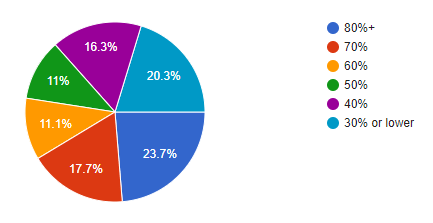 A number that I dont see is a response rate, and completion rates. In order to truly get a sense of data strengh knowing that number would be important. Thanks for the comment Isabelle. We’ll work on updating some additional data in the post soon. Thanks for sharing Michael. Really interesting to see the landscape. My pleasure Anthony! Hope you’re well and thanks for the comment. Could you advise the average hourly rate according to the seniority of staff or in years of experience? Gabriel, great question. I haven’t crunched the #s on that specifically. Something that we can look at and share in our next study if there is enough interest. Thanks for your comment. Hi there, Do you have the response and completion rates, as someone asked above? And do you have a breakdown of fees and other information based on the type of consultant? There are so many consultants (I’m interested in communications and strategic planning consulting) that it would be very helpful to see that. Thanks! Thanks for writing in SH. We’ve noted down the questions, comments and suggestions and will be providing updates on all soon. Thanks! If you take down commenters’ emails, feel free to email it to me directly. Thanks SH. Hope you’ve had a chance to participate in our most recent survey for 2019.